Lesotho, the enclaved heart of our country, pumps fresh water through its veins, enriching the farms which feed us, stirs our imagination to wonder what lies within the high peaks and valleys of the mountain kingdom. And yet many South Africans have never passed through the numerous border posts to see it for themselves, but why? Maybe it’s too close to home to feel like an exotic adventure holiday destination … If so, it couldn’t be further from the truth. Roma, the ‘Stellenbosch’ of Lesotho, an hour inland from the Maseru border post, 150km east of Bloemfontein, is a quiet little university town within a spectacular sandstone mountain amphitheatre, known as the ‘Romarena’. Our race village was the trading post from where the British traded commodities with the Basotho for a century. 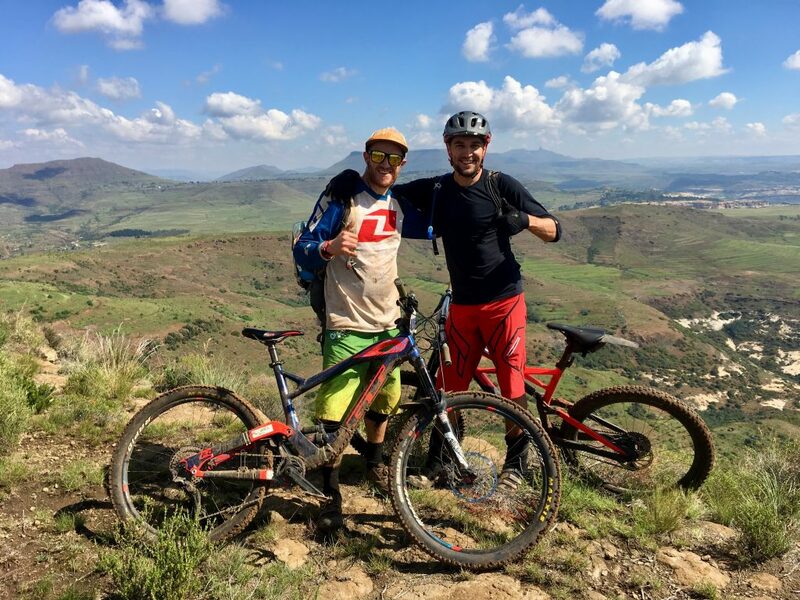 When 40 mountain bikers found their way from all over SA and Europe to Roma recently, it was for very different reasons; to enjoy the mountain trails created by horses, donkeys, sheep and Basotho, connecting remote villages over high ridges and though deep valleys. The Kingdom Enduro is the first Enduro World Series (EWS) qualifying event in Africa, but despite that serious racing element, the relaxed vibe of the race village and event proceedings were unique and refreshing. The manic event WhatsApp group exposed a few mad characters which would keep the riders entertained throughout the weekend and upon arrival in Roma, the stoke level was sky-high despite the heavy rain storms forecast for the first day of racing. 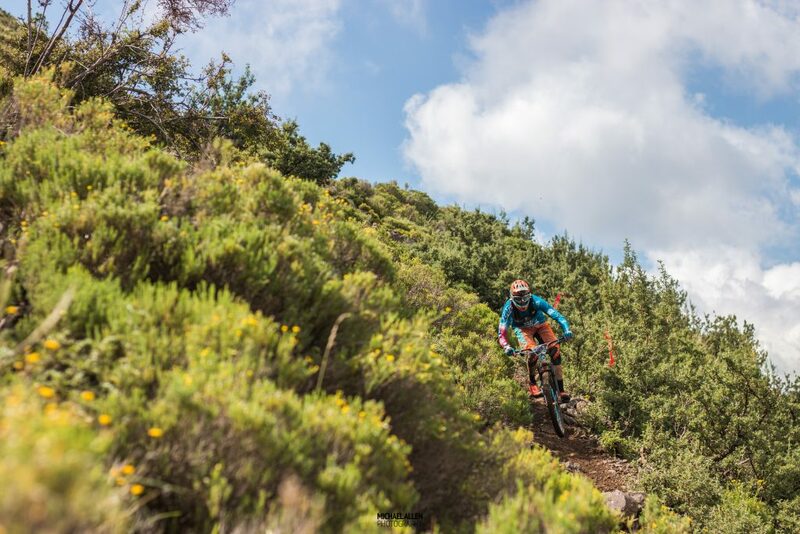 The format was four stages per day for three days of racing, with shuttles to the starts of the remote stages, resulting in about 3500m ascent and 5500m descent! It was cold, dark and rainy on the first morning as we loaded our bikes into a big truck and piled into minibus taxis to be dropped near the start of stage one from where sheep trails led past herdsman huts and waterfalls to the start of stage one. The resident trail builder/finder Rene had very loosely briefed us on the raw natural trails, which caused much anxiety while riders waited their turn to start, not knowing exactly what awaited them in the coming 10min of flat-out racing, yet everyone was nervously excited, ready to face their fears and push their big suspension bikes to their limits. The amazing thing about Lesotho trails is their diversity. 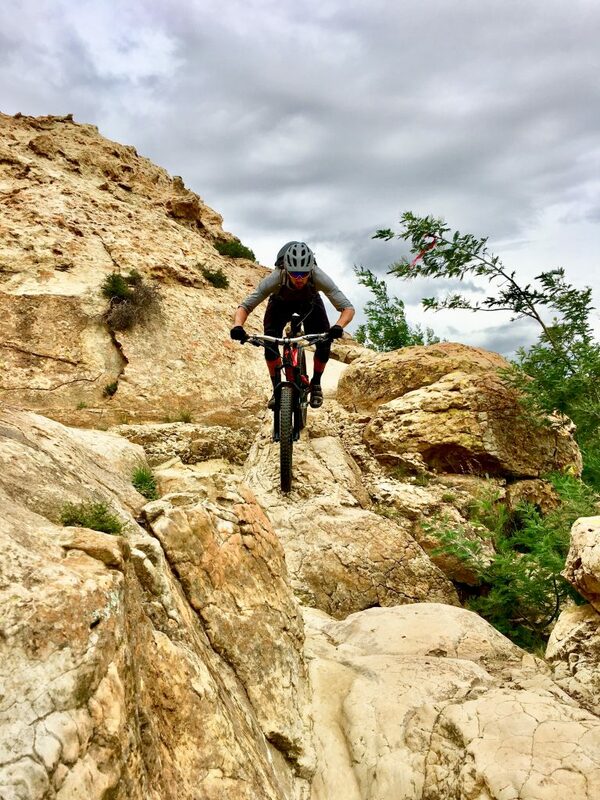 Starting high on slippery embedded basalt rock, down through loose stone on sticky clay and then onto the Moab-style slickrock sandstone layer before dropping into the super-tube gulleys leading to the villages below, so many different riding skills required to navigate one trail! The atmosphere in the rural Basotho village after stage one was one of elation. Everyone had survived the gauntlet and were now mentally prepared for more mountain madness to come. The Kingdom Enduro liaison stages were tough, more portage than pedal, but nonetheless extremely rewarding once the next starting point was reached, always with spectacular 360-degree mountain views, and an exciting but scary trail below. After each stage riders gathered and shared war stories of crashes and near misses. 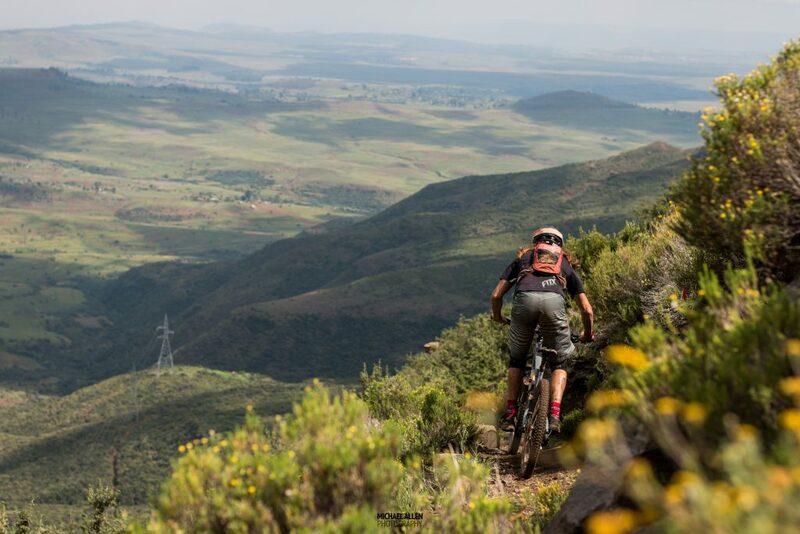 These adrenaline and endorphin filled gatherings created a high energy buzz until the riders calmed down enough to start pedalling and pushing their way to the start of the next wild run downwards. The final stage of Day One was down a sandstone ridge glowing orange in the afternoon light, aptly named Lesothosaurus, for soon after the finish line the trail crossed a rock shelf on which huge dinosaur footprints are clearly embedded in the fossilized mud. Everyone arrived back at the lodge full of mud and unforgettable memories. It felt like a week of adventure in one day, and with a forecast for Day Two of blue skies and sunshine, the mood during dinner on the stoep was electric. An extremely talented international media crew captured special moments and incidents of the day which aired during the delicious dinner. Day Two started with a long shuttle liaison to the top of God Help Me Pass and a hike to a remote ‘kraal’ from where we practiced a Megavalanche-style start, just for cool drone footage. Then the racing started in earnest with fastest seeded riders starting first, chasing each other down an old donkey trail dotted with river crossings, tricky off-camber rock crossings and lots of natural high-speed flow. 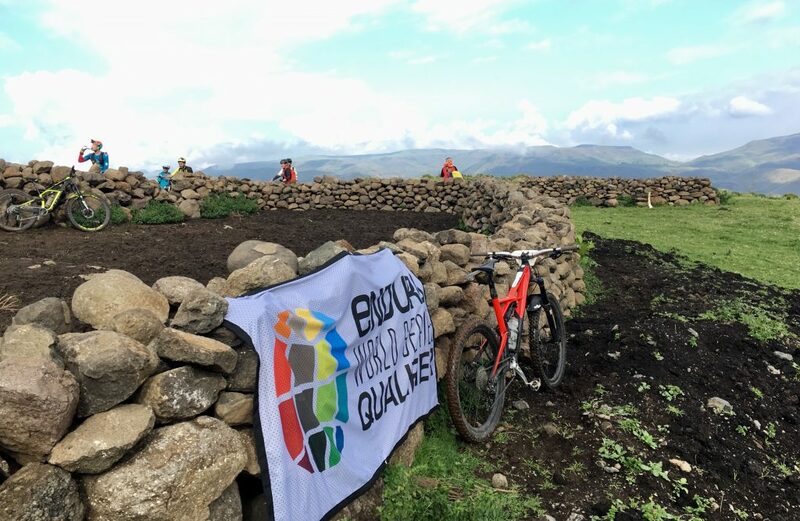 The trails simply got rougher and steeper with each stage, spiced with some controversial ‘punchy sections’ requiring some pedalling fitness and challenged all riders, it was proper technical mountain bike racing. By the end of stage four we were back in Roma after a day of mountain magic, and sense of calm washed over me. 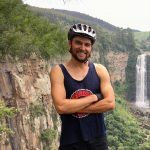 It must have been the combination of so many emotions : relieved to be alive and uninjured, stoked to have pushed my body beyond a perceived limit, happy to have made new friends, refreshed by clean mountain water, humbled by seeing how simply the Basotho people lived in such harsh conditions, yet greeting us with sincere smiles, and inspired to watch more sunrises over big mountains. It was a very good day and the good spirits at dinner reflected that. Day 3 unfortunately started with a heavy lightning storm and meant the final stages around the Romarena were cancelled, however after two great days of riding, our trail lust had been sufficiently satisfied already, and many tired bodies were secretly relieved to have a rest day. Some brave souls headed out to try a nearby trail for slippery fun, while others took advantage of a break in the clouds to enjoy the world class pump track recently built in the village, learning tricks from the local kids who had mastered the art of riding a pump track without pedalling. Leaving Roma and saying goodbye to new friends was very emotional. Even after only four days together, the kind spirit of the Kindom Enduro had brought everyone together like a gathering of old friends. This event is truly special, and I know that I will return to Roma with my mountain bike and friends, since it’s not only a world class mountain biking destination, it’s a cultural and spiritual experience which is rare to find, especially so close to home.